Mr. Myrt isn't sure WHY, but we're going to set up his Twitter account LIVE, and explore options there. We'll also explore Ol' Myrt's Tweet Deck, which makes it a whole lot easier to keep up with several different feeds. Space limited to the first 100 who click to attend at the time of the webinar. Admittedly, it is difficult to imagine that one's genealogical brick walls can be demolished in a scant hour-long broadcast, complete with advertising breaks. Likewise, Ol' Myrt here is sure it takes the real CSI: Miami team more than an hour to solve each horrific crime. Better than Dancing with the Stars and The Biggest Loser are two television shows with family history research as the theme for ~ The Generations Project and Who Do You Think You Are? But television programming being what it is -- must sell advertising. And to do that, the shows must be entertaining and pull in large numbers of viewers. NOTE: The tv image above courtesy of Sony.com. The second season of BYUtv’s The Generation Project premiers tonight, Monday, March 28 at 7:00 p.m. MDT. 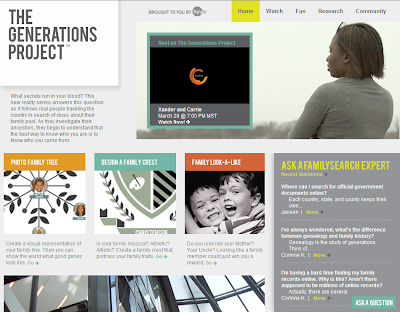 The Generations Project is a reality-based family history show that uncovers the remarkable stories and family histories of everyday people. The people take a hands-on journey to learn about their ancestors, and in the process they discover more about themselves. BYUtv is available through many local satellite and cable companies. In addition, The Generations Project can be viewed live online at http://www.byutv.org (you'll need to register for a free account to view the show live). All episodes are also available to be viewed immediately after airing at http://www.byutv.org/thegenerationsproject/episodes (no registration required). Well into the second season we've received word that the show has been extended for a third season. Perhaps more popular in England, the next episode, airing this Friday on NBS stations nationwide, will feature Gwyeneth Paltrow's ancestral quest. The teaser just says this Oscar-winning actress "is expecting a journey... but what she gets is an awakening," so we'll have to tune in to learn more of Gwyneth's discoveries. So QUIT GRIPING about the one hour limit -- at least a few genealogy research principles are illustrated during each broadcast. Its about time we voted with our time by watching genealogy-oriented television programming. It's also time to write to network execs and let them know you appreciate this sort of television. Support the advertisers, and somehow let them know you heard about it during the broadcast. Network execs know we have a choice when it comes to television programming and they need to know we appreciate their work. Confused by Twitter but want to know more? This live demo takes you through setting up a Twitter account, and modifying your Twitter page and learning about hashtags. Switch gears and explore the advantages of TweetDeck for easily managing your Twitter feeds. TweetDeck is what Ol' Myrt uses to view several columns of tweets at once without going cross-eyed. Each month this year my Monthly Organization Checklist followers have been participating in SCANFEST over at Miriam Robbins Midkiff's blog in a special chat room. Its a place for you to hang out while waiting for you scanner to do the second pass. The March 2011 Scanfest will take place at AnceStories on Sunday, March 27th, from 11 AM to 2 PM, Pacific Standard Time. When Ol' Myrt here last attended, there were all sorts of sample scans, discussions about optimum resolution, and graphic file types. Some were considering new scanners, and it was a great time to compare notes. It seems genealogists do research during the week, and on the weekends we like to talk about it. This weekend in no exception from Ol' Myrt's vantage point. Impossible Immigrants! Case Studies in Tracing Immigrant Origins, presented by Warren Bittner, CG (4:30 PM to 6:30 PM) Enjoy an evening learning to solve "brick wall" immigrant problems. Learn how studying neighbors and relatives in the U.S. can lead to finding their places of origin. Then follow families in European records when they are not found in the towns where they were supposedly born. Learn techniques to correctly identify difficult families. Mini Lecture #1 - What's New at Ancestry.com (7:15 PM to 7:45 PM) with Sabrina Peterson head of Ancestry.com's Global Digitization team. She is also the education chair for FXGS this year, and has done a masterful job arranging speakers and topics for general meetings. Crossing the Ocean with the Internet, presented by Leslie Albrecht Huber (8:00 PM to 9:00 PM) With more sources coming online all the time, tracing your ancestors across the ocean to their European hometowns has never been easier. Familiarize yourself with some important websites for making your cross-continent connection. - Back by popular demand, Leslie spoke last fall at a general meeting, followed by a Saturday workshop. ProGen12 participants are meeting at the BCG booth in the vendor hall Saturday during the first break. Finally, a new episode! And I'll have to catch it on the DVR, darn it. 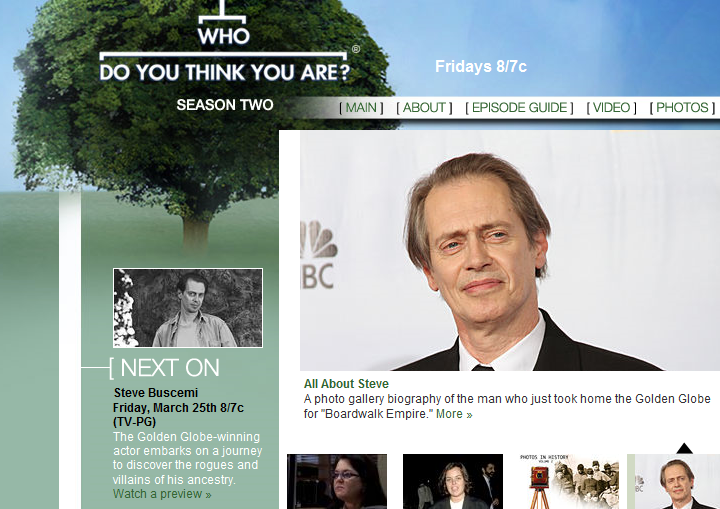 NBC announces "Steve Buscemi The Golden Globe-winning actor embarks on a journey to discover the rogues and villains of his ancestry." Tune in tonight - Friday, March 25th 8/7c, and catch the preview online. AFTER THE TV SHOW, tune in for Thomas MacEntee's GeneaBloggers BlogTalk Radio Show. Its free, and its on the internet, so turn up those speakers -- or better yet, use a headset, so you can call in with your questions. GeneaBloggers Radio will be broadcast this evening, Friday, March 25, 2011 starting at 10PM EST, 9PM CST, 8PM MST and 7PM PST! Thomas tells us "the two hour show will feature special guest Megan Smolenyak who will discuss the latest television programs with a genealogical theme. In addition, we will have a panel of experts including Mark Lowe and Gayle Gresham to discuss how to find your black sheep ancestors." For details on how you can listen and even use the chat room, click here. 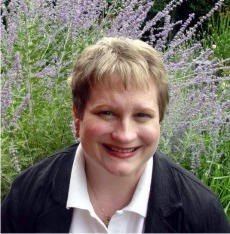 From GeneaWebinars.com we learn that Lisa is giving a fantastic webinar titled Life Stories: How to Write a Compelling Family History Narrative and its free! When: Sat, March 26, 10:00am – 11:30am "Life Stories: How to Write a Compelling Family History Narrative - 1:00 P.M. EST (March Madness Series) A family history narrative is so much more than just the collection of names, dates, and places. You don’t have to be a professional writer to write a compelling family narrative. Learn about key techniques and tools to document your ancestors’ lives, or your own life story. Don't let charts and facts overwhelm you. Discover your creative muse and tell a story your relatives will want to read! Saturday, March 26, 2011 1:00 PM Eastern Time (US) 12:00 PM Central 11:00 AM Mountain 10:00 AM Pacific 2:00 PM Atlantic 6:00 PM GMT Advanced Registration Required. Space is limited. Click here to register. DearMYRTLE's Embedding a pedigree chart in your blog? WikiTree is proud to announce the release of its new “widgets” that enable you to freely display a family tree or pedigree chart inside any web page or blog post. You can start the tree with yourself or any ancestor, as long as you set the Privacy Levels to allow it. There are more than a dozen formatting options with different dimensions and content levels. Most include thumbnail photos of ancestors. Some have background images tailored to families from Chicago, New York, Boston, Nova Scotia, England, France and Italy. See http://www.wikitree.com/about/family-tree-widgets.html for examples and instructions. Names in widgets are linked to the full profiles and extended pedigree and descendant charts on WikiTree. Posting an incomplete tree on a blog may entice family members or distant cousins to help fill in the blanks. When they do, the widget is automatically updated with the most current information. About WikiTree: WikiTree's mission is to create a rich worldwide family tree resource by striking the perfect balance between collaboration and privacy. It gives families a free and easy way to privately share information and organize their facts, memories, and photos. At the same time, it enables distant relatives and strangers to grow a worldwide family tree and create a valuable resource for future historians. WikiTree was started in 2008 by Chris Whitten, the creator of WikiAnswers - one of the top 50 websites in the US. Content on WikiTree is owned and edited by its contributors. Join the free community at http://www.WikiTree.com. WHAT DOES THIS MEAN FOR GENEALOGISTS? update your genealogy info on one genealogy site (WikiTree.com), and have it automatically update through the WikiTree Widgbet to your blog or website. improve access to your compiled genealogy by linking it to your blog. invite participation through the use of these nifty online family trees. "I caught the depressing Rosie O'Donnell episode when it first aired several weeks ago. Quite a depressing episode and a dubious time investment is my take. Sorry if pointing out this stinker of an episode offends anyone, but I gotta call 'em like I see 'em, Myrt." Among the tasks we have as genealogists is to determine the facts of an ancestor's life from surviving documents of the time period. Then we must put that life in historical perspective to gain a better understanding of just who those ancestors were. Sometimes it is hard to view our ancestors' lives without a prejudicial eye because we enjoy 21st century comforts, the likes of which our progenitors never could have dreamed. Revealing Rosie's Irish ancestral roots, including the workhouse tour poignantly illustrate the harsh life that many of our Irish and English ancestors endured. Unraveling the mystery of a grandfather who disappeared 70 years ago was a similarly tender experience for Kim Cattrell. We cannot all have French royal roots like last season's Brooke Shields since, it takes a lot of commoners to pay for a monarch's lavish lifestyle. Wish that I could wrap up my family history in a nice bow, complete with tales of stately mansions, castles and chivalrous knights, but for most folks like me, life wasn't like that for our progenitors. So are ancestral tales of living a meager existence, high infant mortality rates, short life spans, wars and rumors of war, political unrest, crop failures, dust storms, plagues without benefit of antibiotics, earthquakes, volcanoes, pelting rains and flash floods, taxation without representation, fires in tenement buildings depressing? Yes they are. But one or more natural or man-made disasters surely affected our ancestors. To this Mr. Myrt adds "Life was dirty, muddy, unhealthy, wet, dangerous, brutal and short. If you don't like that, don't study history -- family or otherwise." Ol' Myrt here agrees with "Anonymous" that we must call 'em like we see 'em, but we must also take care to remove those rose-colored glasses first. Having two roaming national genealogy conferences is highly desirable in the eyes of many researchers who dislike the thought of consolidating NGS and FGS annual conferences, and I can understand why. Both NGS and FGS meet in different cities each year, bringing genealogy experts to folks in various parts of the US year over year. There are regional experts brought on board for some sessions at both conferences. My friend Roger explained such a merger would translate to a five year rotation, where the conference would be held in the east, west, north, south, and middle US, restricting access to a national conference for residents in any single region to once in five years. This desire for local access to national conference venues speaks to the high cost of travel expenses on top of what genealogists consider hefty conference admission fees. Actually, the conference registration fees for NGS or FGS are a steal compared to what realtors spend at annual conferences for continuing education. I'm sure the comparisons would run similarly in other genres. annual conference. Additionally, most state genealogical societies feature a "name brand" speaker to pull in the numbers at annual conferences. Today's difficult global economy means minding every dollar is a real factor for potential conference attendees. It also cuts the profit margin for genealogy vendors who invest a great deal for booths in the hopes of increasing product awareness. They pray they will recoup their booth & travel expenses. Hmmm... allocating resources more effectively. Is this what Ancestry.com has begun to do by reducing its footprint at NGS and FGS, and by pulling out of the vendor area at Family History Expos all together? The impact of “virtual” presentations changed the face of Comdex. Though the 2004 "in person" Comdex was canceled, now there is www.comdexvirtual.com . The November 2010 event drew 5,000 attendees with 100+ speakers at 50 sessions. The “on-demand” sessions are available through mid-May 2011, and the next ComdexVirtual will be held in mid-November 2011. There has been much talk about how RootsTech 2011 virtual presentations are influencing genealogy conferencing. Because they are easy to set up, we’ve seen a proliferation of genealogy webinars including those hosted by individual presenters, larger regional societies and genealogy vendors. But NGS and FGS "in person" conferences are planned years in advance. Venues have been selected, contracts have been signed. Will NGS and FGS incorporate virtual technology into their annual conferences? Will this “bring the conference” to the masses? Smaller, less expensive regional conferences such as those provided by local family history centers (usually free) or Family History Expos (very low admission fees) are more readily within the reach of the average genealogist, at least from the traveling expense point of view. Ancestry Insider noted a 600 person year-over-year drop in attendance at the recent South Davis, Utah annual conference, sponsored by local Family History Centers. The numbers for the 2011 St. George Family History Expo were hard for me to judge, but I know attendance wasn't as high as in the past. Ancestry Insider cites "back-to-back national conferences in nearby Salt Lake City, Utah: the 2010 National Genealogical Society Conference and the 2011 RootsTech Conference" as the reason for declining attendance at these Utah venues. Me thinks Ol' Myrt here has talked herself in circles. I can see arguments for and against combing NGS and FGS conferences in light of RootsTech's success as not only a techie but a "how-to" conference. Ol' Myrt here understands why NGS and FGS probably won't combine their conferences. It will be interesting to observe the changing face of genealogy conferencing over the next few years. Thomas MacEntee's The RootsTech Revolution – Woodstock or Waterloo? Amy Coffin's Why RootsTech is the Bees Knees where she writes "The vibe had no right or wrong, but instead a common goal. [...] it was a joining together event to discuss what we do and see how we can do it better. I dig this groove and will be looking for other events that share the same philosophy." I couldn't agree more. Thanks, Amy. For fun today, I've been emailing back and forth with Chris of WikiTree.com. He asked me about what changes I'd like to see on my interactive pedigree chart widget. He reminds me this is just in BETA, and that I'll be the first to test this out on my DearREADERS. Be sure to give your feedback on how you like the look of the widget by posting a comment below this post on my blog. What genealogy software programs do is truncate fields or eliminate them on the 5th generation. Does this sort of thing make sense? Will one be able to pick and choose which options they prefer? I also told him I love the photo pedigree, and the little clickable links on each side of the ancestors' names that lead one to descendants and ancestors. Since I started with my father's side of the family, my 5th generation doesn't have a lot of photos. I would favor not having photos there in favor of more info on the ancestors. NOTICE THE "UPDATED LIVE" AT THE BOTTOM OF THE PEDIGREE? This means that when I change an ancestor's info on WikiTree.com, it will automatically update the widget on my blog, or any other website where I've placed the widget. Kewl option, huh? The WikiTree widget below starts with my paternal grandmother,and I've included it here so you can see how "missing" information looks. I just don't know anything about Dolly Yockey's parents -- my biggest brick wall. With Dolly's father, I "estimated" his birth year and place, but in the case of her mother, I left out information entirely. I figured these are two likely methods for dealing with information in your usual personal computer database and I wanted to see how it looks at WikiTree. Something odd has come to my attention. There is a mistaken belief that because Ol' Myrt here favors joining FGS and NGS conferences into one annual event, I am not acknowledging the tremendous volunteer effort it takes to create those conferences. A dear friend brought this concern to my attention and this blog entry is to clear the air. I specifically take umbrage at comments that Ol' Myrt here doesn't appreciate volunteer efforts. My Anne Roach blog comment and my blog post NGS and FGS: Rethink your policies in light of RootTech have nothing to do with devaluing volunteer efforts. The idea that I "don't understand how hard volunteers work" seems odd. Having served as VP of UGA (the NGS 2010 local conference society) and as NGS 2010 Vendor chair, it might just be that I know a bit about how hard those dear, dedicated NGS 2010 volunteers worked. Without the extraordinary assistance from local UGA volunteers and FamilySearch volunteers, NGS 2010 couldn't have run as smoothly as it did. In my old Florida days, I witnessed the work of others who diligently provided programs and library services for other genealogists. As a past president of the Manasota Genealogical Society, instructor for the Manasota PAF Users Group, and working at three family history centers, I learned a great deal about the commitment of wonderful volunteers. It always seems the jobs fall to a few who take up the task ever so willingly. There's just something about rolling up your sleeves with others, and not being afraid to get in the trenches to get the job done, that builds friendships and makes life interesting. You learn a lot about people at these less-than-glamorous times, behind the scenes at a conference. BOTTOM LINE: Myrt appreciates volunteers. People can agree to disagree on the timing of change. People can agree to disagree on just about anything. But to accuse someone of not appreciating volunteers is unkind. That is an attack on the person, not on his or her wacky ideas about remote possibilities of combining NGS & FGS annual conferences. Your fiend friend in genealogy. NOTE from DearMYRTLE: This was just received from our friends at the New England Historic Genealogical Society. Please address all inquiries to amagno@nehgs.org. Boston, MA–March 2, 2011 –The New England Historic Genealogical Society (NEHGS) today announced that, together with the Jewish Cemetery Association of Massachusetts (JCAM), and the American Jewish Historical Society of New England (AJHSNE) have made available for the first time online access to a growing database that currently includes 13 Massachusetts Jewish cemeteries, with approximately 5,000 records. More records are being added weekly until all 106 JCAM cemeteries, which include more than 100,000 total records, are online. The names in this extensive database cover the years 1844 to the present, and, when completed later this year, will offer access to more than 100,000 names of Jewish Americans buried in Massachusetts. “This is one of the first of many benefits that will accrue as a result of our strategic partnership with NEHGS,” said Justin Wyner, chair of the Boston Board of Overseers of the American Jewish Historical Society. “This additional resource is of significant genealogical importance. AJHSNE now makes its home inside the NEHGS research center in downtown Boston. For more information, visit the NEHGS website at www.AmericanAncestors.org , the American Jewish Historical site at www.ajhsboston.org or visit the Jewish Cemeteries Association of Massachusetts at http://www.jcam.org/. February 25th we launched the GeneaWebinars.com site complete with a calendar and blog posting space to spotlight upcoming genealogy webinars. All known genealogy webinar hosts and presenters have access to the blog and the calendar. Reader response has been overwhelmingly positive, so positive that we now have a dedicated Facebook page. This is a very cool and timely blog idea. It was such a smart move to make it possible for others to update. Just last night I put links in my search bar for Legacy and California webinars so that I would periodically check them, but this is much more convenient. Love it! I love having the calendar and contact information all in one place! Thank you, Myrt, for setting this up! The cross-pollination opportunities for the genealogy community are staggering! Webinars are any type of online seminar including those described on the How it works tab at GeneaWebinars. Some webinars require a fee, others are free. Many webinars are archived for viewing later. A society or company may sponsor a webinar, but individual presenters are now moving into producing their own webinars. #1 The "1 computer to many computers" model where individuals can tune in from any computer with internet access to view the distant presenter's computer screen. #2 The "1 computer to 1 computer" model where attendees physically gather in a meeting room equipped with a single computer with internet access to view the distant presenter's computer screen. As members of the GeneaWebinars group, we can share information about technology. With one calendar, we can ensure we're not stepping on toes when it comes to scheduling webinars. As a lobbying group, we can influence our industry. We invite prospective attendees to check out the offerings - over 25 this month alone! We invite prospective webinar hosts and virtual speakers to join GeneaWebinars to get the word out about their upcoming events. Isn't technology wonderful? Tomorrow is the third class session in a series from yours truly about how to do a blog. 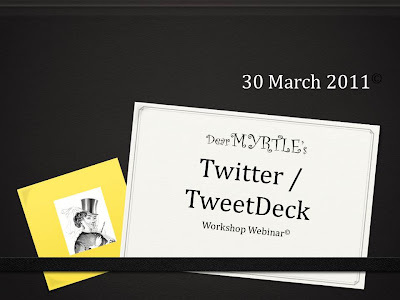 During DearMYRTLE’s Blog Tweaking Workshop Webinar© Ol' Myrt here will tweak one of her own blogs live, and then work through other Blogger.com challenges and solve problems for several other bloggers. The problems we're going to solve are typical of those beginning and intermediate bloggers have in the blog creating process. The selected bloggers have applied in advance for Myrt’s assistance, and have given Myrt author and admin rights to their blogs (temporarily). Each of these bloggers will be able to interact with an open mic during his or her portion of the workshop. I am going to take Brewster Kahle at his word (at RootsTech 2011 about putting everything online) and use the Internet Archive as a place to put the recorded version of the workshop webinar over at Archives.com. I am not sure if this will work, but I'll experiment, and I'll let you know of the file's availability. It's Friday: This must be #WDYTYA & GeneaBloggers Radio night! Mr. Myrt and I await 4 new "hip replacements" for the Ford Van in Des Moines, Iowa. 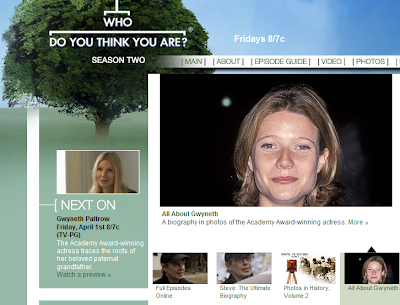 So what better time to blog a reminder about watching tonight's episode of Who Do You Think You Are? on NBC? 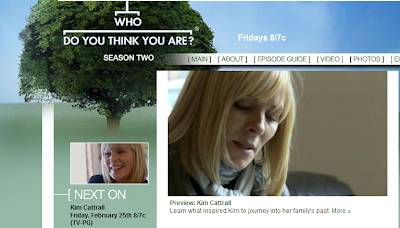 Tonight it will be an encore presentation of Kim Cattrall's ancestral quest. This time I plan to just relax and enjoy the show, without taking notes or tweeting or anything. For my US/Canada readers, here is the link to the archives of this season's shows. Looks like the availability of these episodes expire next September. Good news! Thomas MacEntee will host another episode of GeneaBloggers Radio this evening even though the WDYTYA broadcast is a repeat. Tune in to his show tonight, Friday, March 11, 2011 starting at 10PM EST, 9PM CST, 8PM MST and 7PM PST. Thomas’ two hour show will feature special guest Noah Tutak, CEO of Geni.com. They will be discussing the role of social media in genealogy, how genealogists and family historians collaborate on genealogy research, and about the Geni.com website and its services. In addition, Noah will be available to speak to callers about Geni.com and the genealogy industry. And there will be door prizes: tune in to win one of several great door prizes generously provided by Geni.com including a LIFETIME PRO account!